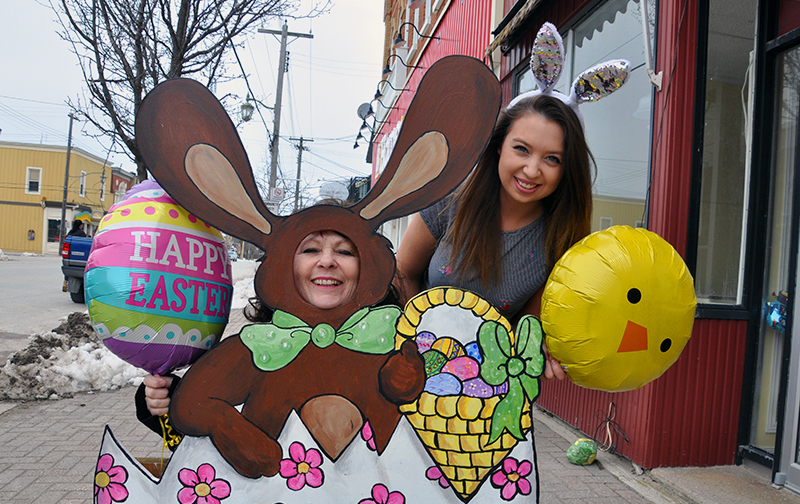 Hey kids, the Easter Bunny is coming to Creemore. The bunny will be making a special appearance in the village on Easter weekend at the invitation of darci-que and Emily Fischl. They have an in with the worldwide celebrity, who is in high demand that weekend. He will emerge from his luxury burrow in an undisclosed location (but rumoured to be in the hills of Creemore) a day early, before making his rounds around the globe. His rider, which was leaked to The Echo, lists lots of fresh organic carrots, carrot slaw, carrot mash, carrot cake and carrot juice. Mr. Bunny’s handlers have confirmed that he will arrive on Mill Street at 11 a.m. He will be strolling, greeting visitors on the street and posing for photos until the bigger egg hunt at The Hort Park and around Station on the Green begins at 1 p.m. sharp. This year’s hunt will be even big than last year’s. Participants will be hunting for 1,000 eggs filled with treats and gifts. Creemore businesses have donated hundreds of prizes for the hunt, which can be claimed at those businesses using the tickets hidden in the eggs. At anytime from 11 a.m. to 2 p.m. head to Bunny Headquarters (in the vacant retail space beside Hillview Cellar Winery, at 151 Mill St.) for crafts, including Easter bonnets, which were a big hit last year. Local students have been asked to draw their version of the Easter Bunny and the images will be displayed on the walls. Patricia Cleary will be providing free popcorn and a photo booth will be set up over at Flowers by Ms Design. Businesses in the village are encouraged to participate by offering an activity at their store or some other offering. This free event is funded by the Creemore BIA. Anyone interested in volunteering for the event is asked to call darci-que at 705-795-5733. The April 20 festivities begin with an Easter market at Station on the Green from 9 a.m. to 1 p.m.
Clearview Community Church is holding an Easter egg hunt at Stayner Bible Campground from 9 a.m. to noon. There will be games and activities. Visit with the Easter Bunny and Clearview firefighters. On Good Friday, April 19, Horning’s Mills Community Hall is holding its annual Easter event, with crafts, face painting, petting zoo and more. There is a pancake breakfast beginning at 9 a.m. and an egg hunt at 10 a.m. The cost is $5 for adults, and children eat for free.